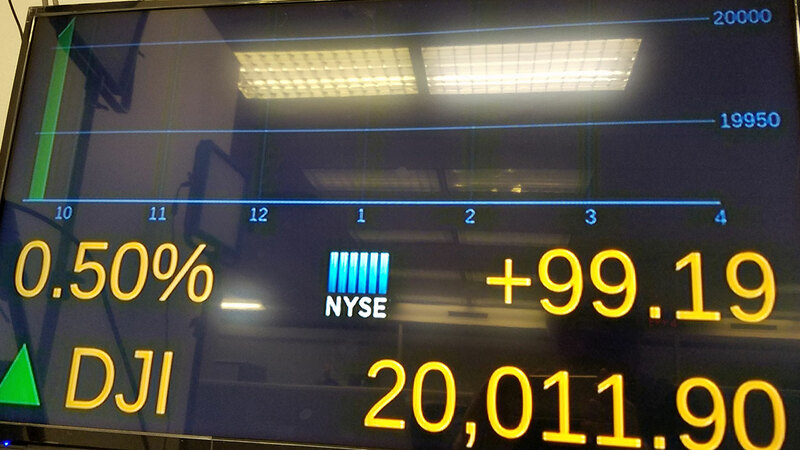 The Dow Jones industrial average is trading over 20,000 points for the first time, the latest milestone in a record-setting drive for the stock market. The market has been marching steadily higher since bottoming out in March 2009 in the aftermath of the financial crisis. The rally continued after the election of Donald Trump as U.S. president last fall. The Dow was up 102 points, or 0.56 percent, to 20,018. The Nasdaq rose 48 points, or 0.9 percent, to 5,600. The Standard & Poor's 500 index rose 10 points, or 0.5 percent, to 2,290. Bond prices fell. The yield on the 10-year Treasury note rose to 2.51 percent.